Pharmacy compounding combines an ageless art with the latest medical knowledge and state-of-the-art technology, allowing specially trained professionals to prepare customized medications to meet each patient’s specific needs. In old times, nearly al prescriptions were compounded by chemists who trained and skilled in the art of compounding. In the 950s., as mass drug manufacturing began to reshape the industry, pharmaceutical compounding experienced a sharp decline with pharmacists simply being dispensers of pre-manufactured medications. 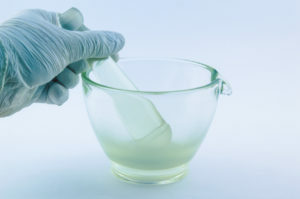 In fact, most pharmacists today, have little formal training in pharmaceutical compounding. In recent years, the demand for professional compounding has increased as healthcare professionals and patients realize that the limited number of strengths and dosage forms that are commercially available do not meet the needs of many patients. LiveWell Pharmacy has the knowledge and expertise to prepare custom formulations for your needs and equipped with one of New Jersey’s first USP 800 Certified state of the art labs built ahead of the 2018 required standards. Ingredients purchased only from FDA registered & inspected facilities. Our commitment is to provide the highest level of patient care and unparalleled emphasis on quality.